EU Chief Negotiator Michel Barnier has said there is very little time left to settle a final Brexit deal. 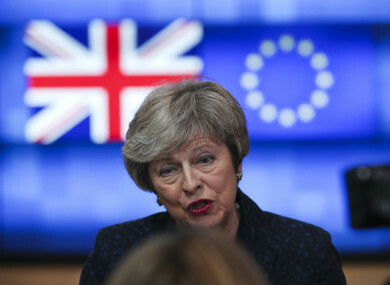 UK PRIME MINISTER Theresa May has dismissed the opposition’s plans to deal with Brexit, telling Labour leader Jeremy Corbyn that she was opposed to keeping the UK in some form of customs union with the EU. This refusal of Corbyn’s Brexit plans effectively closes off another possible way that a no-deal Brexit could be avoided, with just 46 days left now until the UK is set to leave the EU. However, with May needing all the support she can get from all sides of the House of Commons, she did indicate a willingness to make a concession on environmental and workers’ rights. It comes as yet another week of debating and voting is set to take place this week, after the parliament roundly rejected a Brexit deal May had sealed with the remaining 27 EU leaders. MPs are set to vote again on Britain’s Brexit options on 14 February. But a member of May’s cabinet pledged yesterday to give parliament a further ballot two weeks later – a measure meant to give the premier more time for talks with the EU. Her meetings in Brussels on Thursday made no breakthrough and fears of a no-deal scenario that gridlocks trade are running high. In the vote this week, MPs are set to have their say on amendments that could limit May’s options and give parliament a broader say over the Brexit process. May’s Brexit minister Stephen Barclay is set to meet EU negotiator Michel Barnier this evening while foreign minister Jeremy Hunt will visit Paris and Warsaw this week. May is set to meet European Commission chief Jean-Claude Juncker again before the end of the month. Brexit backers in May’s party think the so-called backstop arrangement in the current deal would keep Britain indefinitely tied to EU rules. The DUP also argues that it will splinter the North from mainland Britain. Speaking this afternoon, the EU’s Barnier said that the withdrawal agreement and backstop remain to best solution to avoiding a disorderly Brexit and that there is very little time left to settle a final Brexit deal. If PM May is ready to budge on some of her “red lines” by agreeing to a customs union for example, Barnier said that Brussels would be ready to change the wording of a political declaration on future ties that accompanies the deal. Barnier also reiterated the importance of there being no hard border in Ireland. While stressing that he does not want to interfere in British domestic politics, Barnier said that he has been studying a letter that Labour opposition leader Corbyn sent PM May last week. May has rebuffed Corbyn’s call for London to seek a permanent customs union with Europe, but suggested further talks to try and build more cross-party support for a withdrawal agreement. Email “May rejects Corbyn's pitch as yet another week of Brexit debate looms in House of Commons”. Feedback on “May rejects Corbyn's pitch as yet another week of Brexit debate looms in House of Commons”.